(engi Daruma 縁起だるま) always white? In the beginning, Daruma dolls always had eyes painted. But in the Kanto area around Tokyo, Daruma Dolls with white eyes were sold during the New Years markets. The person who bought it or the priest at the temple had to paint one eye and cast a wish and after the year was over and the wish had come true, the other eye was painted and the doll then burned in a consecrating bonfire at the temple at Years End. You then got a new one for the New Year and the circle begun again. But why did the Daruma dolls not have eyes? Another explanation seems more realistic. If you paint eyes on a Daruma Doll it gets some facial expression and if you are not a good painter, it might look akward or evil. So to sell your piece, it is a lot easier not to paint the pupils and leave the blame of facial expression with the customer when he paints the eyes himself. The next step then was to cast a wish while painting an eye, then burn it after service time was over and buy a new one - who says they did not have good business ideas in Old Edo?! Daruma Dolls were very popular and the habit of getting a new one every year has stayed with us, as we can see at the many Daruma Markets during the New Years Season.
. WHO is Daruma ? sea bream after the fulfillment of a wish . Saint Nichiren and the Tanjo-Ji temple in Chiba. One easy iconographical feature to discern a Daruma are his big eyes. We have already heared that he cut off his eyelids while meditating in front of a wall, because he thought that would prevent him from falling asleep. These big eyes of Daruma are his trade-mark, so to speak. "Daruma to make a wish" (gankake Daruma 願掛けだるま).
. . . CLICK here for Photos for a Daruma without eyes! It is usually a tumbler doll made out of papermachee according to the local traditions that are still alive now. You buy a Daruma without pupils during the New Year celebrations and paint the left eye of Daruma while making your wish. Then you put him up at the Buddhist or Shinto altar in your home. At the end of the year, when the wish has come true, you paint the right eye of Daruma, while giving thanks, then carry Daruma to a temple to have it burned in a holy fire and buy a new one for the next year, and so on and so on. According to Mr. Kido, the selling of Daruma dolls with eyes started around 1764. During that period, many children suffered of smallpox, which is especially dangerous for the eyes. A Daruma was then used at a talisman to protect from this eye affliction. Since a Daruma with no eyes painted has no special facial expression, the dealers soon sold Daruma dolls with no pupils painted and urged the customers to paint one pupil first and the second after they got better. This custom may have started around 1772. But with the vaccination against smallpox in the beginning of the Meiji period the use of eyeless Daruma as protector for the eyes also disappeared, or rather it changed to other departments of good luck in life. The story of Daruma dolls is also closely linked to the production of silk and raising silkworms. During the first casting off the skin of the silkworm in spring (harugo), the fist (left) eye of Daruma is painted with the wish that they have many good moltings and grow big and fat. When the silkworms start spinning their cocoons in autumn (akigo) the second eye is painted. In Takasaki at the famous Daruma temple Shoorin-zan 少林山 you have the eyes painted by the priest. In this case it is the left eye of Daruma. Most other temples follow this rule. In Ogaki town, Gifu prefecture there is also the custom to start with the right eye of Daruma, since the right side generally is considered of higher rank than the left. Some politicians also start with the right eye of Daruma. There are of course other explanations. The Buddhist or Shinto home altar common even now in a household is usually facing South. If you want to put your Daruma for Good Luck on this shelf to pray to it during the year, you put up Daruma with the back to the north and paint the first eye, facing east, to start the day and the New Year. Then Daruma can watch over you during the day/year and in the evening the second eye (facing west) is painted. That makes a lot of sense to me. The equation of space and time as being one is very well represented in the statues of the 12 Heavenly Generals (juuni shinshoo 十二神将 ), which each represent 2 hours of the day and one of the 12 regions of the compass at the same time. If you sit back for a while and meditate about time, usually the idea of the past comes up from behind and your left, while the future is projected into the space before you and to your right. In the temple Jindai-ji the eyes of Daruma are painted in the form of the first and last syllabel of the Sanskrit alphabet (bonji, shuji) , representing the Beginning and End, the course of time in the eyes of Daruma. Of course if you meditate longer, you come to the point to realize that there is NO past and future, but only this very moment, but that is a different problem altogether. Maybe that is another lesson we can learn from a Daruma without eyes. By the way, many Buddha statues are depicted with eyes half closed (hangan) so as to see through time and space, past and future, here and there and all the dualistic concepts we build up in this world. but you yourself have to work towards the fulfillment and make a big effort, otherwise nothing will change in your life! every day you pray to him." If your wish is too unrealistic to come true, even Daruma cannot help you, so be careful about the things to wish. But how long should we wait until the wish is fulfilled? Until the next New Year? After the Election? After getting well from a disease? Usually the New Year is the time to bring the Daruma back to the temple or shirne, but some people prefer to keep him as a memento and put him up at a shelf. Some carry him back after the election is lost. So basically you can do as you please. Here is one more story to explain why, by Mr. Minegishi. In the Genroku period the priest Shunkai Zenji of the temple Kokubun-ji in Nagano prefecture was suffering from an eye disease. He had a statue from a carver in Kyoto of a Daruma with no eyes, so he prayed to this statue for healing. Well, what do you know, his eyes got better and soon after he was completely healed he performed a ceremony to paint the eyes for his Daruma (kaigan shiki 開眼式). The people who heared this story started praying to Daruma figures with no eyes, made of local clay, and soon the temple was famous for healing eye diseases. People who were healed brought their Daruma to the temple to be stored in a special hall. But let us be franc, does it really matter? As long as the person who gets the Daruma is happy with the result, he can paint the first eye in his favorite direction. What is important is to tell Daruma while you paint: "If you work hard for me and my wish comes true, I will paint your second eye." But there are also folks who paint both eyes at the same time, telling Daruma "Well, I give you both eyes now, so you can work even better for me!" What matters is the sincerity and intensity of your wish, not the location of the eyes. "Paint the eye as it pleases you most to make your wish come true and work yourself hard to make it happen!" 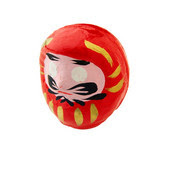 is maybe the best advise we can give to people who turn to a Daruma for good luck. In Japanese there is a saying "to have good luck" "Me ga deta" (the eyes come out, meaning to have the higher number in a game of dice), or a play with words like "Congratulatory" “ME-DE-tai” (eyes coming out), so the eyes are important symbols for winning good luck. There are some Daruma figures, especially little talismans you buy at a temple or shrine, where the eyes pop out to invoke this saying. Here is one you can even order online at the shrine Tenman-gu in Kobe. Daruma with protruding eyes. Me ga deru, to have good luck! A Belgian company about emotional intelligence, time management and self-discipline uses a Daruma for its advertising campaign. FROM a Daruma with one eye TO a Daruma with both eyes. The Daruma doll from Japan is a visual aid to help achieve results. The pupils have to be added to the whites of the eyes one at the time. The first one when a goal is set, the second one on its achievement. The idea is that the unseeing eye will remind you that the goal has not been reached and so prompt you to take action. Translate your thoughts into action! When making a Buddha statue, the most important part are the eyes, which are usually done last and sometimes a big celebration is connected with this event. Maybe the biggest of them all was the great ceremony held for the Big Buddha at the Todai-ji in Nara in the year 752, where the Indian priest Bodaisenna performed the rites of painting the eyes and music and delegations from all over Buddhist Asia were present. Talking about the eyes of Buddha statues, the Great Eyes of some stupas in Nepal come to mind. The eyes of the stupa of Swayambunath are overlooking the town of Katmandu, whereas the stupa of Bodnath is situated in a natural mandala in the middle of the valley and the huge eyes seem to see anything that is going on in the area. and more variations on Japanese Curry. Not only Daruma helps to make a wish, there are other amulets too. medama ire - a game to put the eyes into a Daruma at the bottom of a glass cup!